Justin Rose has returned to Aronimink. 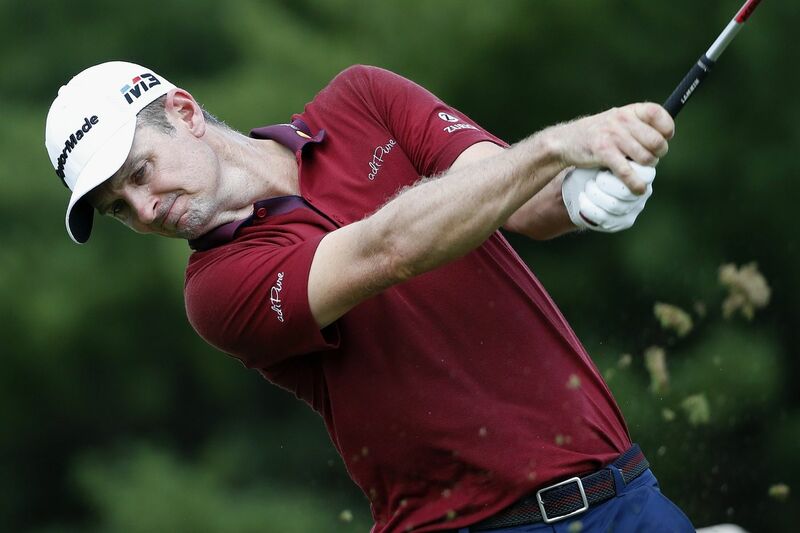 The Philadelphia area has been good to Justin Rose. Two of his nine career PGA Tour victories have taken place about eight miles apart in Delaware County: the 2010 AT&T National at Aronimink and the 2013 U.S. Open at Merion, his one major championship. Rose is back at Aronimink for the BMW Championship, a FedExCup playoff event that begins Thursday. It'll be the first time he has competed in the area in five years, but he has been around more often than that. You see, he liked Merion so much after the U.S. Open that he applied for, and was granted, membership. It's the only U.S. club to which he belongs, he said. "I felt like it was a club that I really wanted to be a part of," Rose, 38, a British citizen who lives in Orlando, said Tuesday. "I don't get a chance to come back as often as I'd like, but it's a place I try to make sure I visit at least one a year, bring a group of friends and enjoy walking down memory lane. "From that point of view, it's always fun. And then it normally culminates in a trip to Pine Valley with the same group. It's a part of the world where there is some great golf to be played, and it's fun to do it with friends." Eight years ago at Aronimink, Rose made two-putt pars on each of his last seven holes for a 1-stroke victory. He returned for the AT&T National in 2011 and tied for 15th. Rose thinks he has an advantage at the par-70 Newtown Square layout, but realizes that goes only so far. "Obviously, the golf course doesn't know anything about past results," he said. "There's nothing given here. Every single tournament that you go to, you have to build a new body of work, so I'll approach it that way on Thursday. "There's no complacency because of past results here, but I just think it makes for more of an enjoyable week on and off the golf course when you win somewhere you're played before." Justin Rose holding the trophy after winning the 2013 U.S. Open at Merion. Rose, who will play for Europe in the Ryder Cup later this month, comes in after a strong finish Monday at the Dell Technologies Championship, where he birdied four of his last six holes to take second place, boosting him from sixth to third on the FedExCup points list. With the exception of Rickie Fowler, who sat out the first two playoff events with an injury, the players in the BMW field have had only two days to travel and prepare for Thursday's opening round. Rose took advantage of his only missed cut of 2018, at the Northern Trust two weeks ago, to get some rest before this push. "When I missed the cut, I knew there was an opportunity to make it pretty much a full week off by going home," he said. "That also coincides with my kids' first few days of school, so that was good. But little strategies like that, I think, are what you have to try and find this year to stay as fresh as possible." Rose said he remembers the routing of Aronimink and looks forward to seeing the work that Malvern golf-course architect Gil Hanse did in restoring the course to Donald Ross' original design, including wider fairways, greens returned to their original shape, and new bunkers. "I feel the changes are going to make it maybe a little bit more playable, a little more approachable," he said. "Guys are going to be able to be a bit more aggressive off the tee." It figures to be a big week for players seeking to finish in the top 30 for the season-ending Tour Championship and contend for the $10 million bonus that goes to the winner of the points race. Rose thinks he can benefit from the success he has enjoyed locally. "I think there's always a bit of a feel-good factor, especially the whole Philadelphia thing for me and the U.S. Open," he said. "It's been a nice story for me. Anytime I come back to the area, I always feel good about it."